Seinfeld, a TV series that first ran from 1989 to 1998 in the United States (and will likely run for decades more) was famous as a "show about nothing." More accurately, perhaps, it was a show about life. It has become the source of a genre of Web sites, books, and miscellaneous whatnot with the general theme "What Seinfeld Teaches Us about Life." One valuable idea that I — and many others — drew from Episode 102 appears in a line spoken by the famous ne'er-do-well character "George Costanza," who says, "…it's not a lie…if you believe it." Whether he's correct or not, it's apparent that "George" does believe what he's saying, and therefore, if his claim is correct, he's not lying. But that's obvious. Less obvious: if the statement is incorrect, is he lying? This is a nontrivial question. In the United States, substantiating a charge of fraud requires that five specific conditions be met, one of which is that the defendant must have knowingly made a false statement. So I decided to examine the connection between statement validity and the speaker's belief. The result is what might be called "The Costanza Matrix." As a legal tool, it isn't worth much, but in the workplace it can help sort out ethical questions when someone makes a false statement. 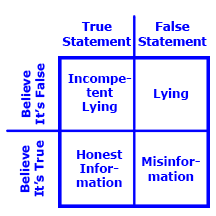 The Costanza matrix is a two-by-two matrix whose axes might be described as Statement Truth and Speaker's Belief, which are, respectively, the degree of truth of the statement, and the degree to which the speaker believes it. Here are the four cells of this matrix. The speaker is honestly conveying valid information when the statement is true and the speaker believes it's true. I call this Honest Information. and Speaker's Beliefis making an honest error when the statement is false, but the speaker believes it's true, whether out of ignorance, stupidity, or having been misinformed. I call this Misinformation. This is the situation "George" was talking about: it's not a lie if you believe it. The speaker is dishonestly conveying disinformation, or is plainly lying, when the statement is false, and the speaker knows it's false. I call this Disinformation or Lying. When the statement is true, but the speaker believes it's false, and intends to mislead, the speaker is lying, but incompetently so. I call this Incompetent Lying. Would you like to see your comments posted here? rbrenWPmWwvPGAuECpyblner@ChacEWLBNisrPaYlmMhXoCanyon.comSend me your comments by email, or by Web form. Most of us have information that's "company confidential," or possibly even more sensitive than that. Sometimes people who try to extract that information use techniques based on misdirection. Here are some of them. I offer email and telephone coaching at both corporate and individual rates. Contact Rick for details at rbrenWBCZqeopgefMSfbVner@ChacgLxZTbRiGrKVbJfyoCanyon.com or (650) 787-6475, or toll-free in the continental US at (866) 378-5470.